From the time I gave birth, I’ve been wanting to talk about nursing wear. I blogged about nursing bras a few months post-birth, but I had such a hard time talking about nursing wear simply because I felt that while there were many stores selling nursing wear, I could only vouch for one local brand — Elin! I wore Elin for most of my trips out of the house early in our nursing days, mostly because it was the only brand whose style I liked, and they have good quality, too — the designs are well thought-out! I really did not need nursing covers even outside with their clothes — they do not simply provide easier breast access in their design, but their clothes serve as a natural cover, too. Anyway, months passed and slowly, I’ve seen a rise of other local brands for nursing clothes, and while a lot of them don’t really fit my size, I’d still like to share them with you. If you are on the lookout for chic nursing clothes, I hope these will be of help. 1. ELIN – Like mentioned above, this is one of the brands I trust. They make clothes with good quality, generally good fit, simple and chic, and best of all, has intelligent designs. I have used their clothes while feeding in public and no one would even notice that I was feeding — this included feeding my son while walking to the airplane from our airport gate. Haha. I love their price points, too. Not as cheap as the others, but also not bad at all for their quality. I just wish they’d make larger pieces — their stretchy tops fit me but the fits are not flattering. I love their Jackie nursing top, and Etienne nursing dress. 2. BUB AND WEAVE – Bub and Weave is a relatively new brand with chic styles. They sent me their Mila dress, but unfortunately, it does not fit me well – but if you’re on the thinner side, do check them out. They have simple and chic styles. 3. 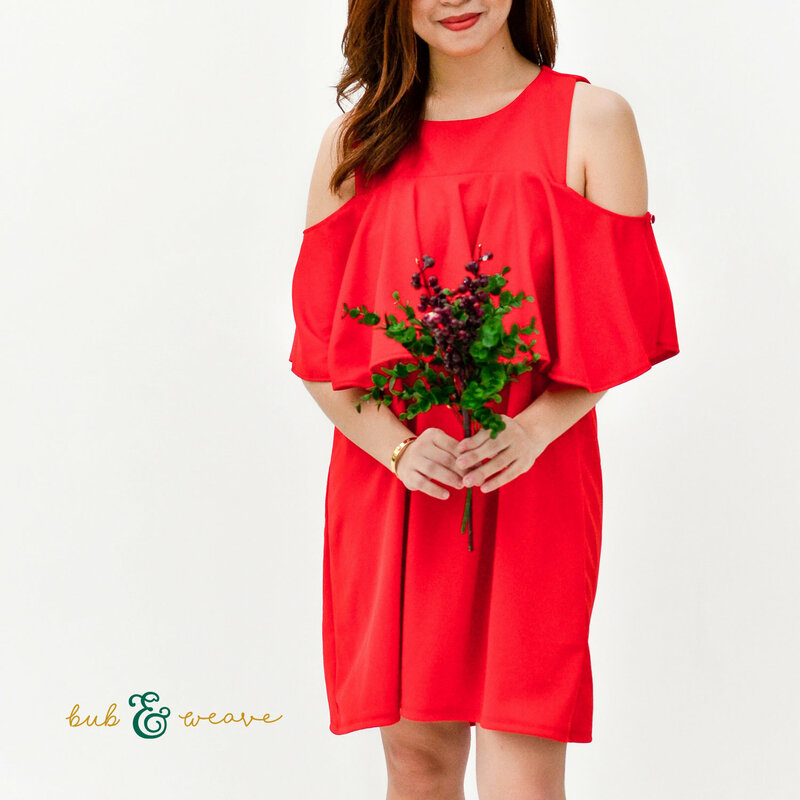 PEARL CLOTHING MNL – I often see this brand online. They are also relatively new, but personally, I have not tried it. From the looks of it though, they also do not cater to larger sizes, and while they do say that their clothes are breastfeeding-friendly, I’m not sure the design is as intelligent as Elin’s. For example, in the dress below, the access for breasts is through a zipper on the side, so if that’s all there is to it, you might still have to cover your dress in some way (unless you are totally comfortable having your breasts out — but I know not all moms feel that way). From the looks of it, this is a breastfeeding-friendly brand, but not really made with nursing as top priority – and I think not all their clothes are nursing friendly, so make sure to check the description and photos. Please do correct me if I’m wrong. Like mentioned, I have not tried this brand, but I am including this brand here simply because I love their styles and would totally wear them if I were thinner, or if they had larger sizes. One really great thing about this brand though, is that they are available in physical stores, so you can go ahead and check their fit before buying. 4. KAYPEE BABY – Personally, I don’t dig each and every style they have, but, you have to check them out yourself to see if there’s a style you like because their price is unbelievable! I ordered their DIWATA MAXI DRESS (recommended for smaller frames and up to 2XL) which I can use for more formal events, and here’s the best part: the fit is not bad at all. I just wish the fabric in front is a bit longer so it can cover more tummy area, but to be honest, this has way better fit than the stretchy Elin dresses I bought for more formal events, too. Another great thing about this dress: it works two ways! I am so happy because the retail price is only PHP 450. I also like their Chyna dress (also works two ways)! 1. If you’re new at breastfeeding, I highly suggest getting actual nursing clothes, especially if you live in a tropical country like the Philippines. I lived in nursing clothes the first few months because I was still really figuring out proper latch, comfortable position, etc, so living in nursing clothes especially when going out saved me because I didn’t have to worry about one more thing: covering my breasts while in public. For some moms, they feel comfortable showing their breasts, and personally, that’s fine with me. But personally also, I don’t want to deal with awkward stares anymore, especially since the Philippines is still pretty much a conservative country — so I really appreciate nursing clothes for the design. For this specifically, I can vouch for Elin. No one noticed I was feeding most of the time — people often thought I was just holding a sleeping baby. regular tops with tank tops underneath — I only recommend this when you’re going somewhere cooler, because really, having two tops in Manila is too hot for me. But with this technique, you can wear any top on the exterior, pull it up when you need to feed, and pull down one side of your tank top. I love doing this for trips abroad where the weather is much colder. 3. For basic t-shirts, I found one from a Mommy Mundo fair before. The brand is called Mommy Matters. But it seems they’re not actively making clothes anymore. Too bad, cause for everyday shirts, their basic v-neck would have been perfect for stocking up — has good design for nursing, and thick enough that you need to wear a bra even when you have guests around (haha), but even if their shirts are thick, they are surprisingly not hot. I love that they have sizes for bigger women like me, too. I got them really cheap, too, but I think it’s because they were only finishing whatever stocks they have left. 4. For dresses you can wear for formal events like weddings, Elin and Kaypeebaby have simple dresses that may be used for such. I also saw a few from Ellie and Me, but if you’re really looking for something elaborate, it’s probably best to have one custom-made for you. 5. Lastly, if you’re reading this and you’re still pregnant, let me tell you one money-saving tip: don’t spend a lot of maternity clothes. Buy nursing clothes instead. There are a lot of maternity slash nursing clothes, and I would totally go for this. I can’t use many of maternity dresses now because there’s no access for breastfeeding, and since they are dresses, if my son needs to feed, I’d have to pull up the whole dress, haha! So if you plan to breastfeed, put more of your money on nursing clothes! So, that’s it for today – my local finds and nursing tips. If you know more brands, do let me know and share your experiences at the comment section! Happy nursing, momma!